It's been over a year since my trip to Tajikistan, and I long to return. The people were kind and I learned so much, not only language but also about many other things. Going through my photos, I realized there were a few other fiber and textile pictures I hadn't blogged about yet. These are cell phone pics, so sorry about the rubbish quality. 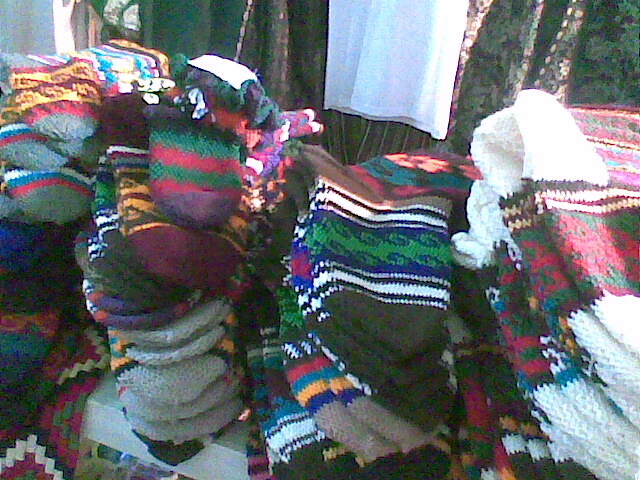 Also at a stall in TSUM, these are piles of traditional Pamiri socks (jurab or jurabe or jourab). These socks were common to find at any tourist shop - they're made in bright colors from thick yarn. When I examined them, I came to the conclusion that they were crocheted - and, upon further research, it turned out I was right. In fact, these Pamiri jurobho are probably the oldest crochet tradition in existence - they're formed entirely out of slip-stitch crochet. European crochet only dates back to the 1800s, but these jurabs may be much older. Unfortunately it's hard to tell how far back the tradition goes. 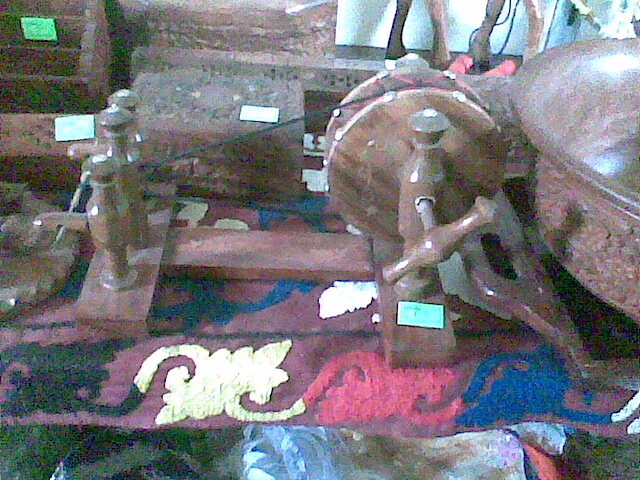 De Pamiri is one company that is working to keep the Pamiri jurab tradition alive. When I was researching the Pamir socks, amazingly enough the most interesting and detailed resource was from Crochet Insider. They have a huge number of articles on the Pamirs and their crochet traditions: An interview with the De Pamiri founder; Pamir trip 1, 2, 3, and 4, and From Carpets to Jourabs. Also of interest is Adventure Yarns, which produces luxury yarns by locals in Central Asia for the Western market. In Tajikistan they raise angora (mohair) goats and cashgora goats, and local women spin and knit them into saleable products for income. Here's an outline of their fiber process. I despretely want one of those Charhkas:>. We even made one based on an Indian design but I'd love to find one for sale. My Mom and sister just went to India for 2 weeks and couldn't find one anywhere. Sigh, I'm 100 years too late. This information is just what I need as I research the socks that my dad recently brought home from Dushanbe. Many of these links have expired! Let me know if you update them! !